The best car I have ever owned was a 1998 Nissan Maxima. It had a lovely and powerful 3.0L V6, a 5-speed manual transmission and a comfortable leather interior. That particular engine won numerous “Best Engine” awards throughout its use. Producing a healthy 190 hp and 205 lb-ft of torque (it was a lot back then), the Maxima could accelerate from 0 – 100 km/h in just over 6 seconds making it the quickest Japanese sedan available at that time. As a mechanic I also loved my Max for the brilliant engineering. I owned that car for nearly a decade and when I finally traded it in the odometer was reading just over 400,000km. In all that time the only major repairs were replacing one alternator, a starter (which took – and I kid you not – 10 minutes to swap out) and the CVT joints. 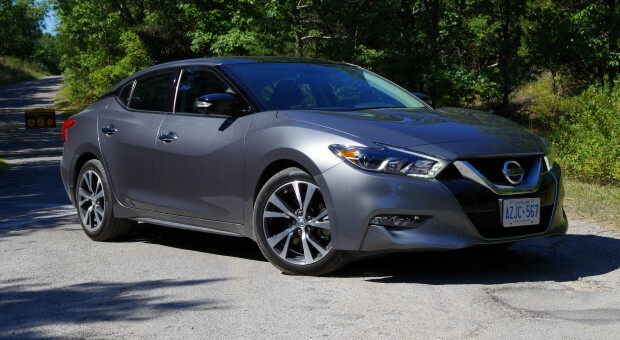 Nissan has long promoted the flagship Maxima as a 4-door sports car. The one I owned was a blast to drive, but I would call it a sports sedan, not a sports car. 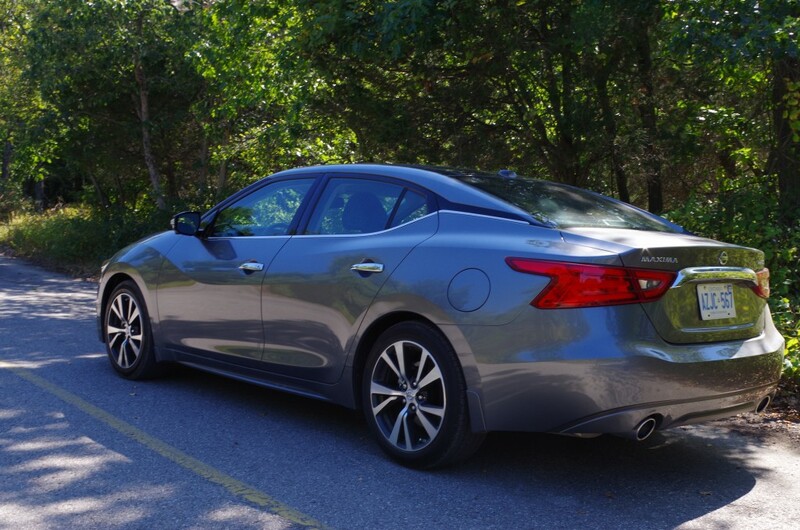 Recently, I was given the keys to the all-new 2016 Maxima Platinum model. This car is very striking. I had seen pictures online, yet was not prepared for just how exciting the new design is in person. Unfortunately photos just cannot do it justice. Each body panel is curvaceous, sculpted and flowing. The body is wide and sits very low; it looks hunkered down ready to attack some corners. The new Nissan grille is used to great effect, adding some much needed aggression to the overall presence. My test car had 18” wheels but 19” are optional and do come standard on the SR model. Incidentally, the SR is sportiest of the models, with paddle shifters, tuned suspension, an integrated dynamic control module and aluminum pedals. Adding to the premium appearance are the LED projector headlights (found on the SR and Platinum models) as well as the standard LED running and rear lighting. After much time spent admiring the many body lines, I opened the driver’s door and was greeted by a sporty flat bottom steering wheel (which can be heated) and a driver centric dash. The seats in the Platinum model feature ascot leather with a diamond pattern. In terms of ambiance, this really punches things up. (Leather is found even in base models – as is heated front seats, heated mirrors and rear view camera.) 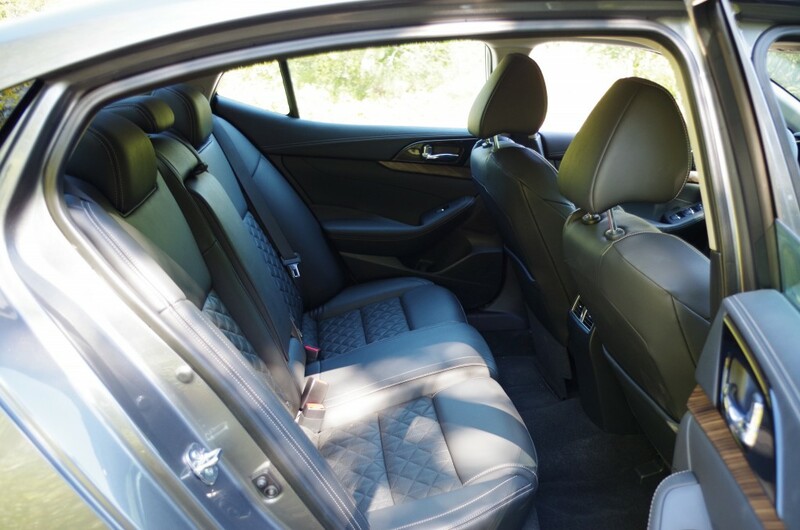 The seats are set low and provide extreme levels of comfort even on long drives. Four adults will fit comfortably, but five will be tight, unless the fifth is a contortionist. The center console is angled toward the driver bringing all the controls within effortless reach. There are 2 information screens: a 7-inch screen located in the instrument cluster, and an 8-inch touch screen in the center console. The touch-screen will no doubt impress with its swipe, pinch-to-zoom and slide functions that we are all so accustomed to. As an example, navigation instructions found on the center screen can be “slid” over to the screen in the gauge cluster, freeing up the center for the front seat passenger to continue playing DJ. The center console also has a rotary dial in the middle arm rest that enables one to control various entertainment and vehicle functions, without having to lift one’s arm. The limited use of buttons really cleans up the interior. Nissan has stayed true to its flagship roots and kept the V6 powertrain we have come to love. This specific version puts out a healthy 300 hp which is more than enough to keep you grinning. Pushing the start button awakens the 3.5L engine with a low snarl that gives a “not just another sedan” impression. The 0 -100km/h time is under 6 seconds and the engine response to your right foot is immediate. The Maxima has even stolen some technology from the GT-R. For example, it has sodium-filled valves. The thoroughly tweaked engine is smooth and can pull all day long without any complaint. If my tester had a 6-speed manual I would not have returned it. I would have sent a check and kept the car. However Nissan is in love with the dreaded CVT. Nissan is trying to reclaim the 4-door sport car title. It has even placed a “4DSC” moniker in the taillights. But how can a true sports car be driven by a CVT? In short it can’t .I will say this though, Nissan engineers have put a great amount of time and effort into hiding the CVT tendencies that we all loathe, and they have been mostly successful. They even reworked the transmissions software, programming it to respond to sensor inputs for throttle position, road grade, and G-load during cornering and braking. But I am fussy and this CVT still exhibits a tendency, albeit minor, to rubber-band – that is – to maintain a set rpm while the speed increases, effectively neutering that fantastic soundtrack from the engine. 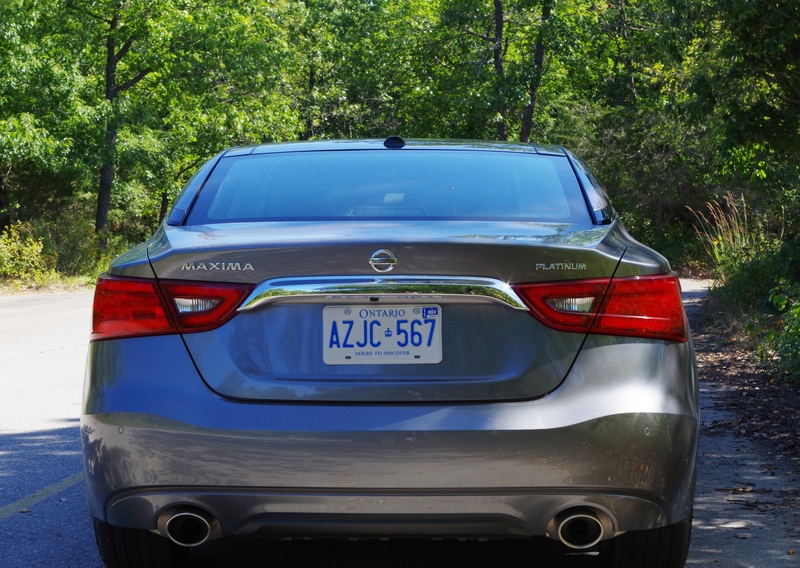 Speaking of engine noise, the Maxima has Active Sound Enhancement which was needed to allow the occupants to hear the engine because of all the sound deadening done to keep outside noise from entering the tranquil cabin. 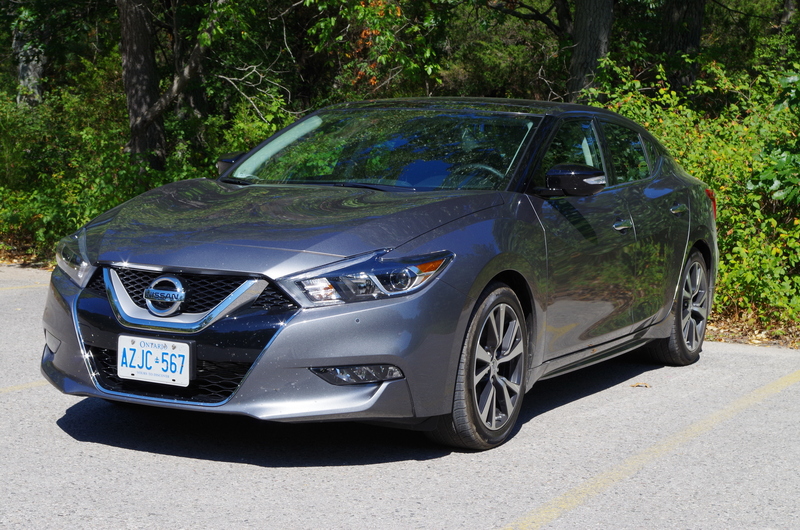 Aside from the CVT let down, which I admit is mostly personal preference; the Maxima is a sporty drive. Corners are taken flat with no noticeable roll. This is due to some stiffening of the structure by generous application of light-weight high strength steel and to the new suspension. In the front, the Maxima uses twintube shocks, and in the rear monotube shocks all supplied by ZF Sachs. The resulting ride is composed and comfortable, while enticing you not to let off the throttle before entering the bends. The thick leather steering wheel delivers a very real sense of how the wheels are connecting to the road. The steering itself is weighty, direct and well-tuned. 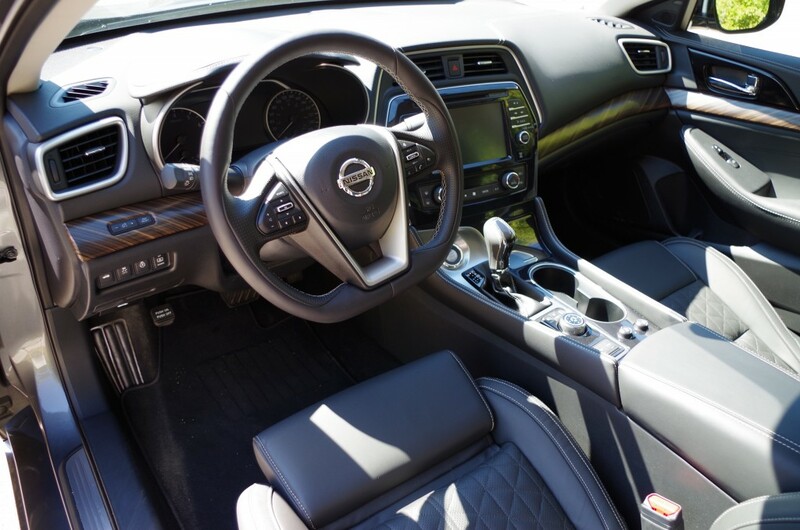 Being the flagship, the Maxima grants you access to all of the latest Nissan technology. Systems like navigation, voice recognition and voice-to-text are all standard equipment. The Platinum model adds driver attention alert, surround view monitor, moving object detection and an active cruise control system that is the best I have ever used. Let me explain: In most vehicles, when the you pull into the left lane to pass slower traffic (and you have been slowed from your set velocity) most active cruise control systems seem to be completely ignorant to the fact that you have the intention of accelerating. The car eventually realizes what is happening but by the time it reacts, other left lane motorists are breathing down your neck and gesturing wildly and rather crudely. The same scenario in the Maxima is different. As soon as I signalled it felt like the transmission “dropped a gear” and the car began to accelerate as I moved out of my lane. This prevented the left lane traffic from flying up to my rear end with horns blaring. Genius! 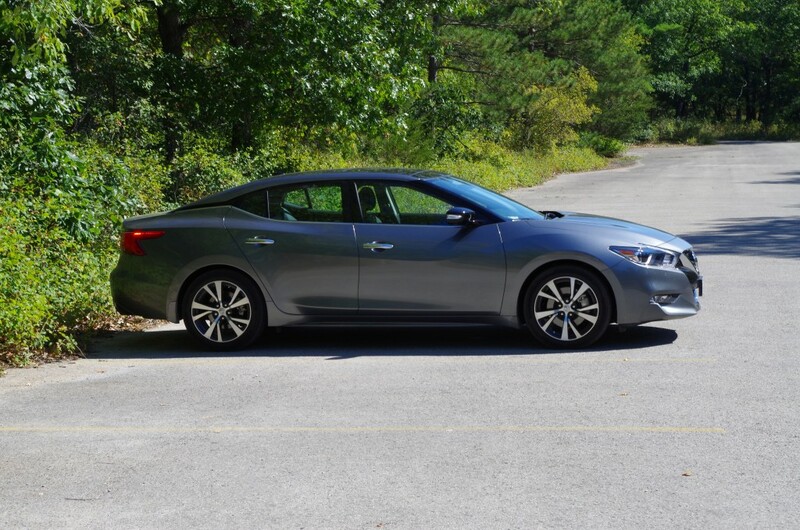 So is the 2016 Nissan Maxima a sports car? Not in the purest sense, but it is a real sports sedan. It has reignited my admiration for the model. The new styling will get the attention of your neighbours and strangers alike. The magnificent V6 will entertain you to no end, and despite the CVT, the overall experience is exciting and that is rarely found today, especially at such a low admission price. During my time I was able to get more than 800 km out of a single tank of premium gas and I averaged 8.7L /100 km. 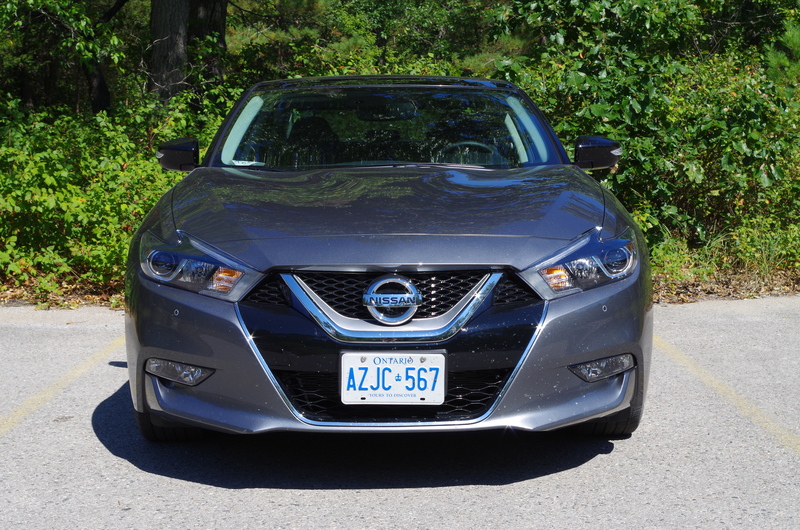 The Maxima has two modes, neither of which are “ECO” and I like that. So if you want some excitement, but need 4 doors, you may just want to check this one out.